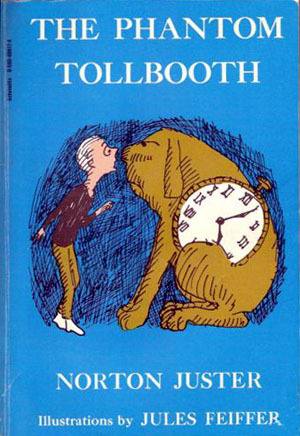 You know, literary types are very quick to wax poetic about the books of their youth—Alice in Wonderland, The Little Prince, The Wizard of Oz—but I find the common absence of Norton Juster’s The Phantom Tollbooth from bookish bookshelves a prime offense. I hate to generalize, but some people marry into Italian or Greek families, and I just happen to be marrying into a book family, so I feel like I’ve got a good two years of experience backing me up. When Daniel Handler (as Lemony Snicket) released A Series of Unfortunate Events, the series was lauded for humorous wordplay and a reoccurring habit of alluding to real-world works of literature. Handler’s foray into YA lit is worthy of the praise it continues to receive, but acting as if his series is the first to heavily utilize figurative language is problematic. Why? Because that assumption ignores The Phantom Tollbooth. A Series of Unfortunate Events is decidedly gothic, more Lewis Carroll than Norton Juster, but the attempt to weave fact into fiction is one of the most striking characteristics of The Phantom Tollbooth. I suppose it is like hiding peas inside of a picky child’s mashed potatoes, but Juster, a professor of architecture, does it with the skill and grace of a true maestro. He can barely finish a paragraph without peppering it with nudges and winks that an adult would recognize right away. If you, assuming you are an adult, sat down and reread The Phantom Tollbooth now, you’d notice a great number of things you may have missed as a child: the Awful DYNNE that is actually a djinn, the Senses Taker that purposefully wastes Milo’s time, and King Azaz the Unabridged, ruler of Dictionopolis, has a name that is just a version of A to Z, A to Z. The book’s ultimate hypothesis, that there is no one wrong way, is undeniably complex compared to the intellect of its target demographic. But Juster is a smart man, and I can’t imagine he’d knowingly write a novel too complex to be appreciated; if anything, I bet Juster wanted The Phantom Tollbooth to be appreciated by readers of all ages. Knowing his work, it makes more sense that the author intends the book to be read by the same reader several times, but at different points in time. I am probably a good example of his intended audience, because I read the book as a young child, and then as an adolescent, and finally as an adult. I am sure I still have missed a few of his little tricks, but I think that I’ve spotted most of them by now. Juster engineered the novel as a puzzle, as an architect would. A well-designed building never serves just one purpose, and neither does The Phantom Tollbooth. It functions on multiple levels, each suspended in time, simultaneously connected and separate. And while architecture is inextricably linked to mathematics, fiction writing is similarly intertwined with the business of enchantment. Whether or not Juster has managed to marry both favorably is up to you.